Campsis flower (Lingxiaohua)-Campsis grandiflora (Thunb.) K. Schum. Botanical Name: Campsis grandiflora (Thunb.) K. Schum. Source of Earliest Record: Shennong Bencao Jing. Part Used & Method for Pharmaceutical Preparations: The flowers are gathered in full bloom. They are then dried in the shade. Properties & Taste: Pungent and slightly cold. 1. Amenorrhea caused by blood stagnation. Campsis flower (Lingxiaohua) is used with Chinese angelica root (Danggui), Safflower (Honghua), Red peony (Chishao) and Siphonostegia (Liujinu). 2. General itching due to endogenous wind caused by excessive heat in the blood. 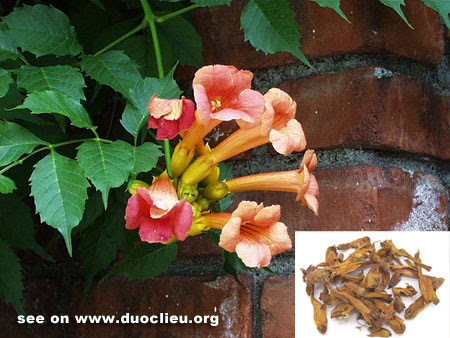 Campsis flower (Lingxiaohua) is used with Moutan bark (Mudanpi), Fresh rehmannia root (Shengdihuang), Tribulus fruit (Baijili) and Cicada slough (Chantui). Cautions & Contraindications: This herb is contraindicated during pregnancy.